Palate/Finish: Complex, with a myriad of dried fruits & spices. Orange, pears, apricots, & a distinct nuttiness. A great finish that lingers for around 10 minutes. 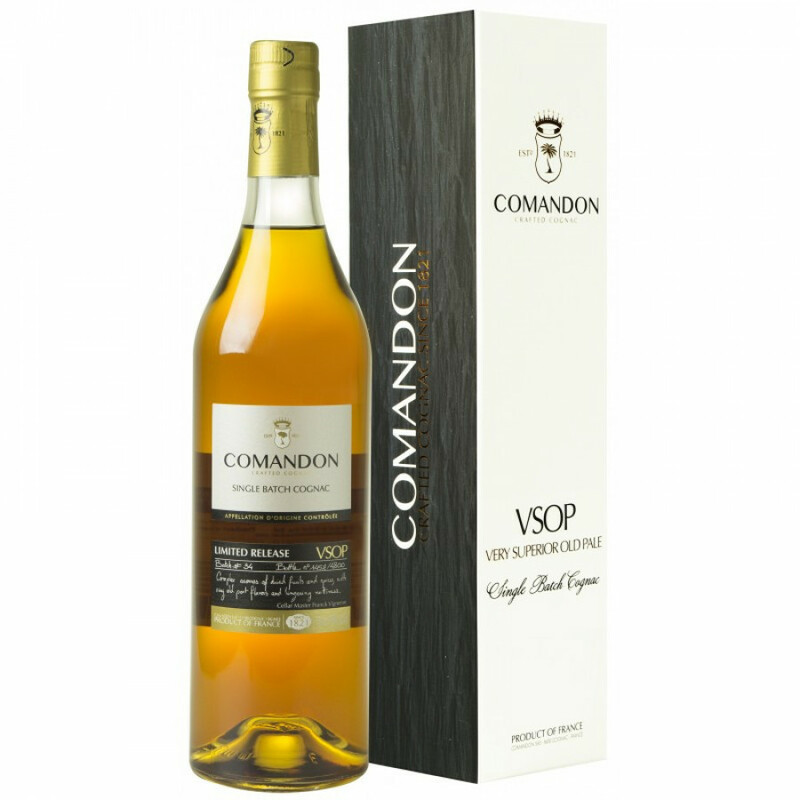 The Comandon VSOP Cognac is one that’s an excellent example of how very good a Cognac of this age quality can be. The average age of the eau-de-vie that makes up the blend far exceeds the legal minimum, and this is truly apparent in the sublime taste experience it offers. It’s an award winning Cognac made from wine from the Fins Bois terroir. Not to mention that it’s a single batch creation, meaning that it really is a case of, ‘once it’s gone, it’s gone’. Each of the eau-de-vie within the blend has been aged between 8-12 years, in red Limousin oak casks. The end result is an extremely superior VSOP that offers outstanding value for money. Comandon Cognac is truly an independent house. Everything to do with their creations is carried out in-house. So you can be sure that when you purchase one of their Cognacs that you’re experiencing not only a quality liquor, but one that’s been created with the passion and intimacy that only such an artisan house can offer. This Cognac is created in a limited edition, and each one is individually numbered. Typically there are only around 3,000 bottles produced, with the choice of eau-de-vie used presenting a very distinct taste profile. It’s a very versatile spirit, and can be enjoyed in many ways. It’s definitely worth experiencing neat, thanks to the complex taste profile and wonderfully long after taste. But it can also be well used as a luxurious addition to your favorite cocktail, or with a mixer of your choice to make a refreshing long drink—perfect for a warm day. A double Gold medal at the World Spirits Competition in San Francisco. High score of 91 points at the Ultimate Spirits Challenge. In short, this is an outstanding VSOP quality Cognac, and a true testimony to how great the products from Comandon really are.